The installation “Return To My Sleeping Wall” will be exhibited from 7 to 31 October in the Klaipeda Cultural Communication Center. The installation was done by the Austrian artist of Russian origin, Lena Lapschina (1965). There are a number of artists in contemporary Europe that were born in Russia, but who now perfectly fit into the context of having new countries of residence, and already associate more with them than with the land of their birth. This is the case with Lapschina, who graduated from the famous “Stroganov Moscow State University Of Arts and Industry”; she has been living and working in Vienna and “lower” Austria for a long time now, and has been constantly participating in international art projects and biennales. Just this year she has had three solo exhibitions: in Austria, Switzerland and the USA. And before the end of 2015, she will be exhibiting in Serbia, Italy and London. First and foremost, she is known as an installation artist who has multi-layered, but always relevant, overtones. We met with her for an express interview on the details of her latest works. Could you describe for us your new installation in Klaipeda, "Return To My Sleeping Wall"? It's the idea of moving, starting, trying things out. It's about time and place. Consecutio temporum; present continuous and future perfect. Changing places of presence brings new surroundings, new people, new language; new views and ideas. You wake up remembering "Oh yes, I am on the Baltic", and after installing "Return To My Sleeping Wall", you could cross over to the Curonian Spit to run along the sand dunes and watch the locals jump into cold seawater. Which is a nice contrast to the Tyrrhenian seaside, which is where I just came from after finishing a work for the new Museum of Contemporary Art in Cosenza. All that moving always has to do with walls. Museum walls, gallery walls... And with a temporary place to live. I'm using here the metaphor of sleeping in space, and bringing the paradigm of weightless floating into the experimental cube at the KKKC. 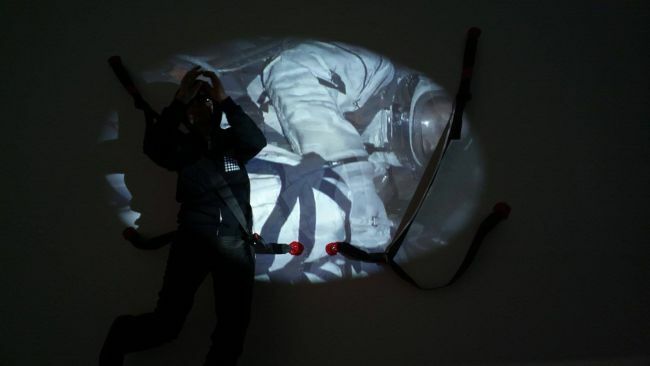 Visitors can strap themselves to the wall, close their eyes and start dreaming as a video about space travel is projected onto their eyelids. 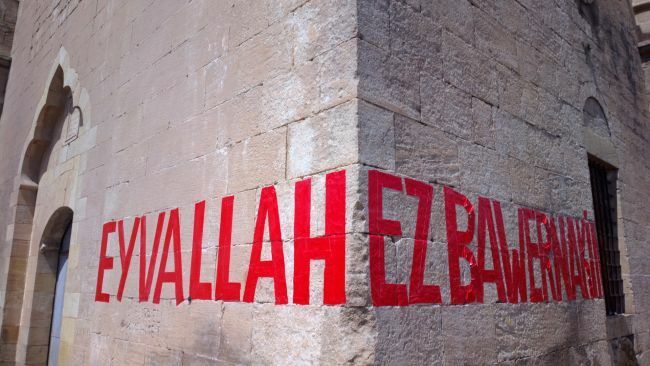 This year you also participated in the 3rd Mardin Biennale. Your work is connected with language and writing. Why have you chosen these themes, and how do you execute them? People can imagine an incredible amount of things when they hear or read something. They are just overloaded with visual information nowadays, and this is robbing them of their imagination power. So I decided to paint words. The word is a very simple picture. And the word was first. 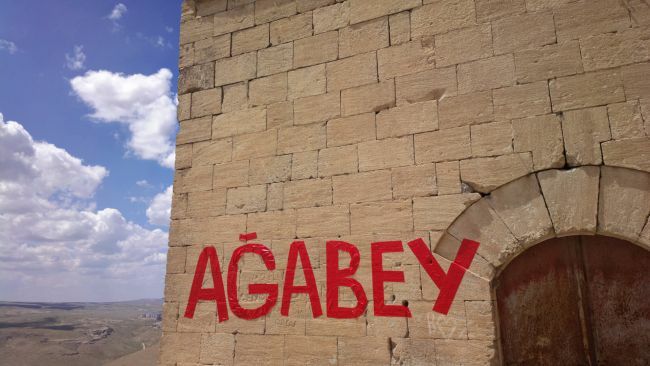 For the 3rd Mardin Biennale (Mardin is an ancient city with Turkish, Syrian, Armenian and Kurdish communities), and with the Syrian border in sight, I developed a series of murals in the public space that were based on very common words from the Turkish and Kurdish languages. Words with different meanings, like “brother” and “big brother”, which form sentences if you wander the streets. In November of this year, I plan to bring these kind of murals to Malta – to the Mdina Biennale, to be exact. Words appear to make up a significant part of the world for you. You video-work from 2015 was also called "Words". What kind of words can we see in that piece? "Words" is quite a new series of short films, with each one lasting two minutes. Forming a common thread are compound words I've grabbed from the German language. I've learned to like the German language a lot. You can build beautifully long words out of two, three or four different nouns. You know, like zeitgeist, doppelgänger, etc. By the way, next week I'm going to debut two of the latest parts of this series, "Schaulust" and "Zugzwang", at Sluice Art Fair in London. And my new artist's book is going to have a signing event, too! 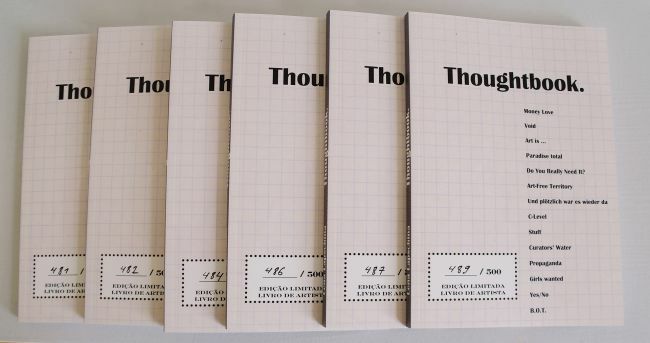 I call it a "Thoughtbook"; with plenty of blank pages. You came from Russia, but now live in Austria and communicate in English. Do you feel that you belong to any particular culture? Are you a Russian artist or an Austrian artist? One could never deny having grown up on Russian culture, so the first assumption could be the correct one. But every time I return to Austria from an overseas exhibition, I feel I have "come home", so now I would say I'm an Austrian artist.